Originally part of Pioneer Cooperage (a wooden barrel manufacturer) the Fibre Drum Co. incorporated in 1946 in Kankakee, Illinois. As the need for larger containers grew, Fibre Drum expanded to include Lockring Drums as well as Steelkraft Drums to meet our customer's needs. Today, we produce containers from 3 gallon to 67 gallon capacity with the possibility of anything in between. Quality and customer service has been the key to success for Fibre Drum, maintaining many of our customers for more than 40 years. 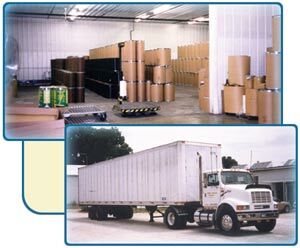 To ensure prompt delivery at competitive prices, we work with many common carriers as well as our own trucks. We thank you for taking time to check out our website, and give us a call or email us at sales@fibredrumco.com with any questions or special requests you may have.